The brand new Galaxy Tab 7.7 has inconspicuously left the IFA party early. Announced just a few days ago, the Android tablet has now been pulled out of the expo by Samsung, including all demo units and references. Even Samsung’s own German website has apparently been updated to remove all ads and previews of the device. Exactly why Samsung decided to take down the displays is not yet clear, but it is likely due to the ongoing legal feuds between the South Korean manufacturer and Apple. The Galaxy Tab 10.1 is still banned in certain regions and the Galaxy Tab 7.7 doesn’t sway too far from its older sibling in terms of design. With that said, Samsung may have been requested to close the curtains on the new Galaxy Tab or could just be playing it safe. 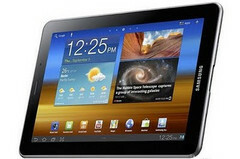 The German ban on the Galaxy Tab 10.1 is currently scheduled to last at least until September 9th. The dual-core 1.4GHz Galaxy Tab 7.7 will have a 7.7-inch 1280x800 resolution Super AMOLED Plus screen, 64GB SSD and run Android Honeycomb 3.2. Samsung is still holding back expected release dates for the new tablet.